As you may or may not know, in 2017 one of my New Year’s Resolutions was to read 50 books and I finished off the year with a grand total of 88 books. I thought that was pretty amazing so for 2018 I upped my goal to 100 books! 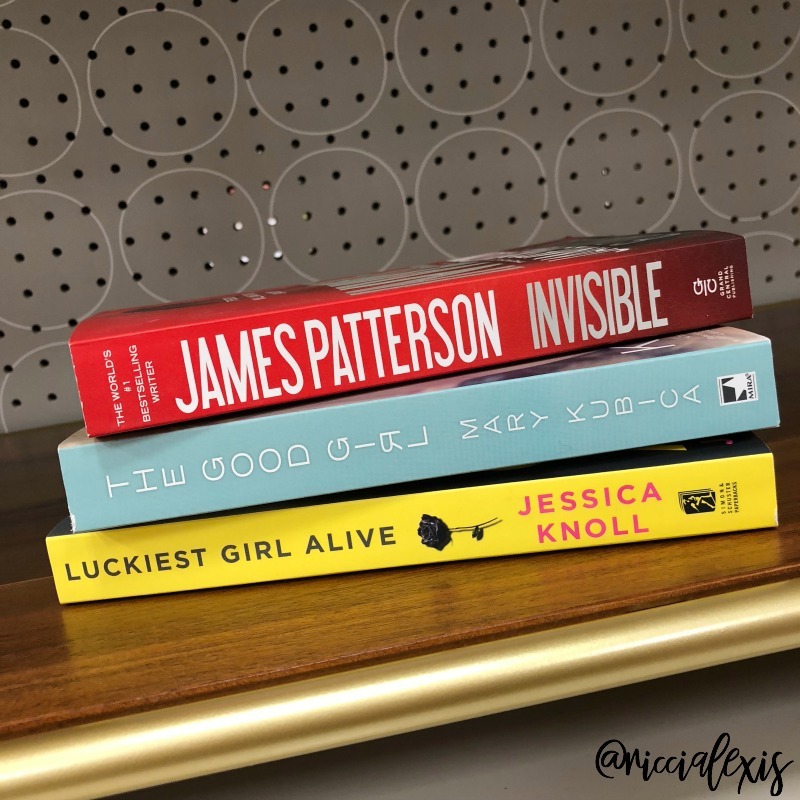 I know it sounds like a lot but I think I can do it…plus these “What I’m Reading” posts are favorites of mine to write because I love getting book recs from other bloggers so hopefully you can find a good book for two to read! I know a lot of people are thinking “how do you read so much?? You must not do anything else!”. HA! I actually read the majority of my books via audiobooks on my local library’s app! I also check out e-books to download to my Kindle app. It’s rare that I read an actual book with pages because they just aren’t as portable or convenient as they once were and that’s kind of sad. I remember thinking I would never pick up on the e-book “trend” because I love the feel of a real book in my hands. I love the smell of books and turning pages. If you had asked me 3 or 4 years ago if I would switch to almost exclusive e-books I would have laughed at you, now I’m eating my words and I am thoroughly enjoying myself! Don’t worry, I still buy actual books, just not every single book I read! So now back to HOW I read so many books…audiobooks are my JAM these days. I listen to them when I get ready for work, when I’m cleaning my house, while I am at the gym or the park, while grocery shopping, while I am driving, etc. It’s actually rare that I listen to music anymore these days but that doesn’t bother me because now I get to “read”all day! if your library has an e-library they probably have audiobooks you can download and listen to through your phone! I LOVE it! ONE. Dashing Through the Snow by Debbie Macomber. I love a good Debbie Macomber book. Her books always have a good love story to them and her Christmas books are like Hallmark movies (in fact a lot of her books have been made into Hallmark movies and right as I finished this one I watched the movie, HA! )…a little predictable but with a good twist! This book is about a girl trying to get home for Christmas and her only option is to get home in a rental car with a strange man. They have a good adventure which involves a dog, a night of karaoke and a police chase! It’s a really great read and perfect for winter reading! TWO. 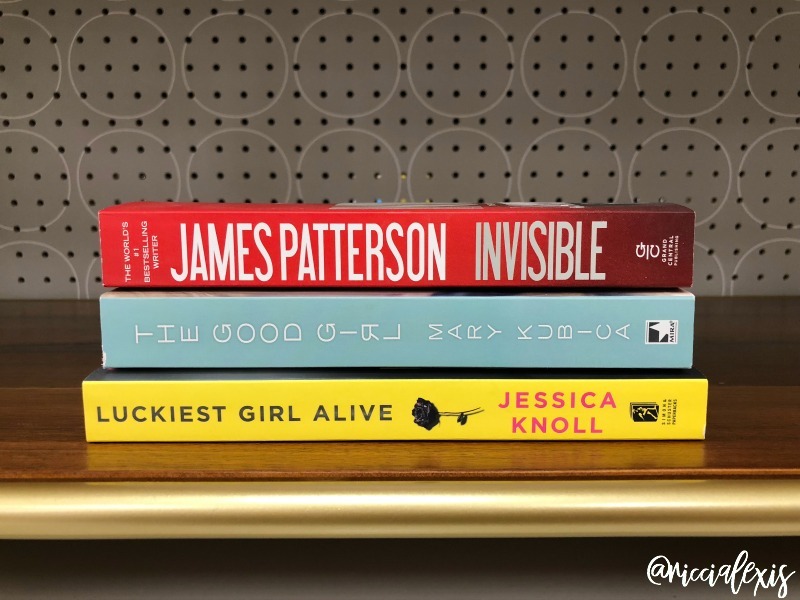 Invisible by James Patterson. I guess I was on a James Patterson kick this month because not only did I read this book of his but I read two more! HA! Invisible is about an FBI agent who lost her sister in a house fire and is trying to make a case against against an arsonist , she thinks her sister was murdered but the police who investigated her sister’s house fire called it an accident. It was a page turner for sure!! THREE. Judge and Jury by James Patterson.This James Patterson book is about a mob boss who is on trial and one of the jurors, an aspiring actress who is in for the role of a lifetime. Again, another page turner! FOUR. Tribute by Nora Roberts. I think I love Nora Roberts almost as much as I love James Patterson. This book is about a former child star who is rehabbing her famous actress grandmother’s old farm. Think Chip and Jojo minus Chip (I also love a good home renovation story, makes me want to paint something. HA!). Of course someone is out to murder the former child actress and the story of why and how are really good! FIVE. Pretty Baby by Mary Kubica. If you are in to psychological suspense then you will love this book! 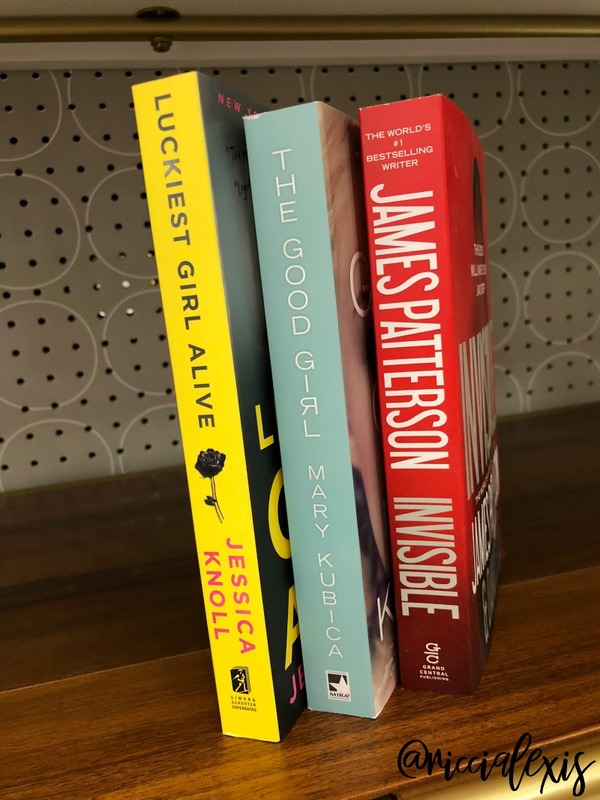 I have previously read Mary Kubica’s The Good Girl and Every Last Lie. I think I need more MK in my life. This book is about a homeless girl who has a baby and the woman who takes her in off the streets. It’s a dual story about losses and head games. I loved it!! SIX. Mrs. Fletcher by Tom Perrotta. This was my silly read of the month. I needed something light after all the murder mysteries and this book nailed it! It’s a book about a woman who’s son goes off to college and what she does to fill her time…looking for love, taking classes, meeting new friends. It is also a book about there son and his college experiences…his relationships, his downfalls and the lessons he learns. It has a fantastic ending and was a really great read! SEVEN. Guilty Wives by James Patterson. Rounding out my JP books for this month is Guilty Wives. I know I read this book before but I couldn’t for the life of me figure out the ending. It’s about 4 women wrongly accused of a crime in France and are locked away in prison for life. The story is about home driving their innocence and the consequences they faced. EIGHT. The Favorite Sister by Jessica Knoll. Disclaimer – this book doesn’t come out until May 2018. I got an advanced copy to read for review purposes and if you want the info on how to get these email me! This is Jessica Knoll’s second book, her first was The Luckiest Girl Alive and it was GRIPPING. Is seriously couldn’t put it down it was that good. Have bene patiently waiting on a second book and here it is! If you are into reality tv drama and murder mystery then you will love this book! It’s about a group of women who star in a reality tv series when one of them is murdered. This book explores the relationships between all of the women, the secrets they keep and of course, “whodunit? ?” FANTASTIC read!! NINE. Can You Keep a Secret by Sophie Kinsella. Again, I had the feeling that I had read this book before but I don’t think I had. I’m pretty sure I have read every other Sophie Kinsella book out there though so maybe her writing style was just familiar to me?? Who knows. This book is about a woman who shares all of her secrets with a “stranger” on a plane. One by one they all come out and her world is turned upside down! Or is it?? TEN. Heartless by Marissa Meyer. Marissa Meyer wrote one of my favorite YA series, The Lunar Chronicles” so when I saw this book on my library’s e-book selection I jumped on it! While The Lunar Chronicles was loosely based on Cinderella this new series is loosely based on Alice and Wonderland. It’s familiar and different and I loved it! Next, please!! So there you have it, my first 10 books of the year! Hopefully I can seep up this pace all year and KILL my 100 book goal. I have been thinking about writing a post on my favorite authors. Is this something you would be interested in?? Let me know in the comments!! 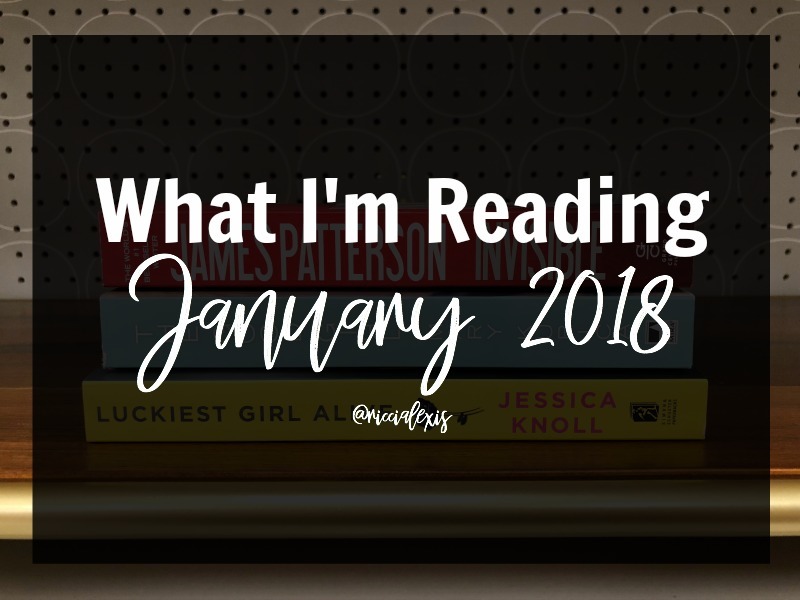 What books did you read in January?? I’m headed over to purchase the Debbie Macomber and James Patterson books. They’re my favorite authors. I am such a bookworm, I read just about a book a day so I’m excited to learn about these titles. I am always looking for good books to read so I love posts like this that give me great ideas of what to read! On my next plane ride I know what I am going to read! Thank you for the awesome title suggestions! I have an upcoming trip that involves a long flight and could use some engaging reading material. These sound like some good books, I have to admit I do like James Patterson so I will have to check out that book from him. I love to read. It is one of my favorite ways to relax. I am always looking for new books to check out. Pretty Baby sounds really interesting. I read How To Be An Overnight Success by Maria Hatzistefanis and LOVED it! I appreciated the short chapters with tips I can use at the end of each chapter. You have some excellent book suggestions here. Thank you I will check them out! Wow, that’s a lot of books for the year! My husband is a reader too, not sure how many but I’m pretty sure it’s up there for the year too. Wow, 100 books is an awesome goal! I used to read every night, but now I am working so hard and burning the midnight oil, I am too tired to read. I wish I had time to read. I’m not sure I will have time until all of my kids are in college. I used to read a lot, but just don’t have the time to do it now. Hubby even bought me books to read. I started reading them like a decade ago and haven’t finished them yet. LOL. I’ve never taken advantage of reading via audio apps, but I’m thinking I should give it a try. I do so many things throughout the day where listening to a book would make the time go faster. I love this goal. Reading is a great way for me to relax. Audiobooks are great in the car. I will have to challenge myself and see how many books I can read this year. I loved Pretty Baby! It was such a good book.